Crested Geckos (Rhacodactylus ciliatus) are a nocturnal, arboreal species native to the islands of New Caledonia which are north of Australia and in between New Guinea and New Zealand. They can be found on the ground or in vegetation, but usually no higher than 12 feet. Originally thought to be extinct, they were rediscovered in 1994 in surprising large numbers. Crested geckos reach a length of 10 inches and females may be larger than males. The name Crested Gecko refers to the long row of superciliary scales that start above the eye and run down the side. They have a prehensile tail, which when lost, does not regenerate like that of many other gecko species. 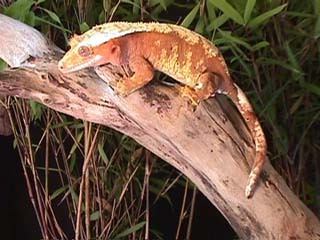 Crested geckos come in a wide assortment of colors ranging from tan to burnt orange. They are relatively easy to maintain and breed. They feed on insects and fruit baby food mixtures. A fun and interesting gecko to work with. Central American Banded Geckos ( Coleonyx mitratus) are a nocturnal species inhabiting dry, open forests from Guatamala to Panama. This banded gecko species averages 5 to 7 inches in length. It is easy to maintain and breeds well. This is an under appreciated gecko that makes a great addition to any collection. Unusual pattern morphs are sometimes available. 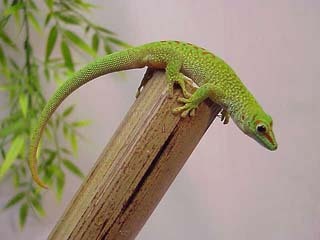 Giant Day Geckos (Phelsuma madagascariensis grandis) are a large diurnal, arboreal species. They inhabit northern Madagascar and other localities. Their overall coloration is a vivid green with varying amount of red in the form of flecks or large spots. Males can reach a length of 11 inches, females average 8 to 9 inches. This is probably the most popularily kept day gecko species. They are quite responsive and realtively easy to maintain. They feed on insects and fruit preparations such as baby food. UV light is recommended. 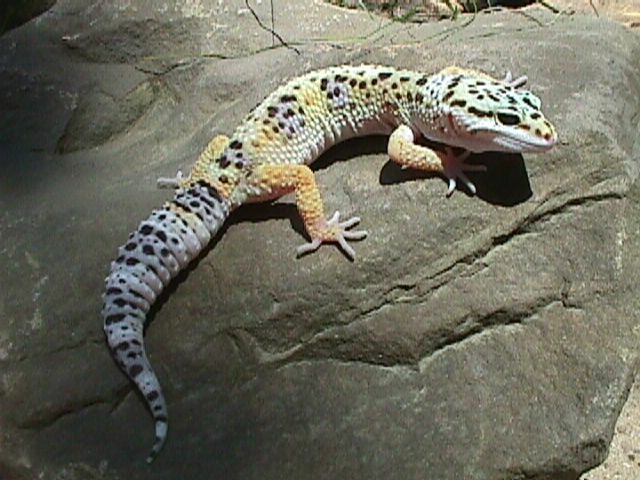 Leopard Geckos (Eublepharis macularius) are nocturnal, terrestrial gecko originating from Afghanistan, Iraq, Iran and northwest India. They inhabit dry to semi-dry desert regions.This gecko reaches a length of 10 inches, with females being slightly smaller. The common name refers to the leopard like patterns found on the “normal” animals. 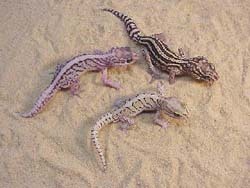 These geckos are the “standard” of the pet gecko trade. Many color variations have been produced in captivity. They are insect feeders, although larger animals will take “pink” mice. Panther Geckos (Paroedura pictus) are a nocturnal terrestrial species native to the drier portions of south and southwestern Madagascar. Habitats include dry forests, rocky savannas and even sand dunes. When not active, they find shelter under rocks, bark or burrow in the sand. Panther Geckos reach a length 5 to 7 inches when mature, with females being slightly smaller than males. A “banded” and a “striped” phase occur naturally and many other interesting variations are being selectively bred in captivity. The ground color of the body consists of various shades of brown with light tan, white or cream colored markings. Hatchlings tend to be chocolate brown with golden markings. These geckoss are insect feeders and are very prolific if maintained properly. 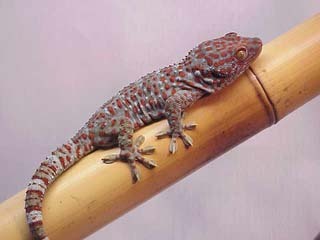 Tokay Geckos (Gekko gecko) are large nocturnal, arboreal geckos native to Asia from N.E. India to the Indo-Australian Archipelago. They inhabit tropical rain forests, living on cliffs and trees and often in human abodes. They are one of the largest geckos reaching 12 inches in length. Individual coloration can vary from dark slate gray animals to ones with beautiful powder blue backgrounds with many red spots.Although they can inflict a painful bite, captive raised specimens can be handled and make interesting “pets”. Tokays feed on a large variety of insects, small mice and some will take fruit. Madagascar Spiny Tailed Gecko ( Paroedura bastardi) This nocturnal species is native to the dry forests of south and central Madagascar. 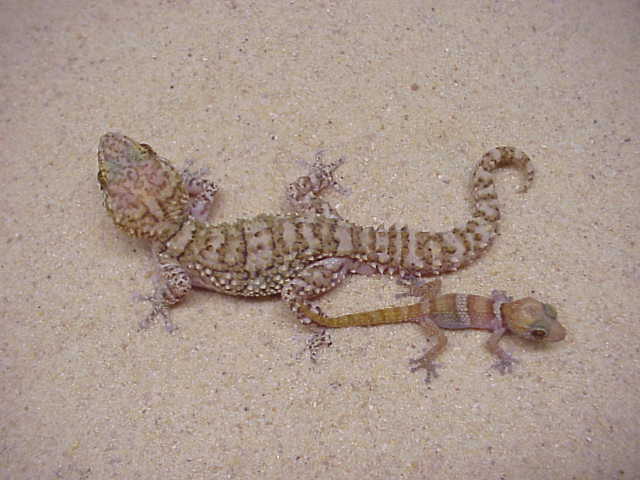 It is similar to the Panther Gecko in habits and requirements. Adults average 5 to 6 inches in length. These geckos are fairly new to the pet trade and at least two sub-species are currently in US collections. You are currently browsing the AdamBouskila.COM weblog archives for March, 2007.